The thyroid is an amazing little butterfly shaped gland in your neck. This endocrine gland regulates metabolism and helps to regulate blood calcium levels. It does this by releasing hormones. This article will be focusing on the hormones regulating metabolism- T3 and T4. 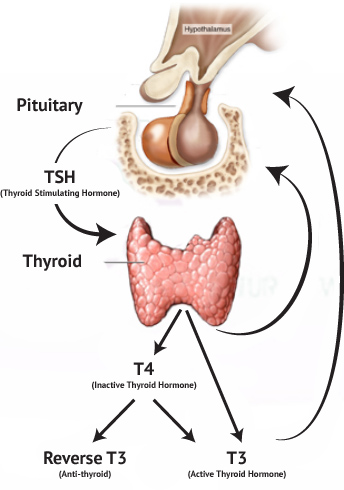 In response to thyroid stimulating hormone (TSH) released from the pituitary gland, the thyroid releases T3 (20%) and T4 (80%). These hormones are formed from tyrosine (an amino acid) and iodine (a trace element). Although T4 is produced in much larger amounts than T3, T3 has much more of an effect on metabolism. Once released by the thyroid gland, roughly 80% of T4 is converted into the much more active T3 in a process called de-iodination. T4 can also be converted to reverse T3, which binds to the same receptors as T3 and blocks the action of it. In these cases, the patient may be experiencing symptoms of hypothyroidism, despite other thyroid hormones appearing “normal”. Reverse T3 tends to increase during times of stress or malnutrition, and can be tested if high levels are suspected. TSH decreases in response to adequate circulating thyroid hormone, which is why a high TSH is often indicative of a hypo, or low, functioning thyroid. Has Hashimoto’s thyroiditis, and autoimmune condition where the body has formed antibodies to components of thyroid hormone production. This is the most commonly diagnosed form of hypothyroidism. Is a poor converter of T4 to T3. This is often overlooked with standard labs. Has hypothyroidism related to adrenal dysfunction. Is or is not getting adequate nutrients to support thyroid function. Has a problem higher up, such as low pituitary function. Hypothyroidism is a very common condition, estimates of prevalence range from 1-8%, with an estimated 13 million undiagnosed cases in the US. Hypothyroidism is much more common in females, but can affect males as well. If you suspect or already diagnosed with hypothyroidism, as us how we can help!